It was the first time in several months that militants used rocket artillery in ATO zone. These attacks were recorded in the south of Mariupol sector. “In Hnutove and Talakivka the enemy used Grad MLRS and Grad-P rocket launchers in Shyrokyne. These weapons systems were accompanied by mortars, grenade launchers, and small weapons fire,” reported Ukrainian Ministry of Defense spokesman on ATO Colonel Andriy Lysenko during a press briefing at Ukraine Crisis Media Center. The shelling started a fire in the field which then approached residential buildings but was promptly extinguished. Another hostile attack was recorded in Bohdanivka. “In total, eight hostile attacks started in Mariupol sector yesterday, five of them involved heavy weapons. The enemy fired over 10 mortar shells and 58 Grad missiles,” summarized the spokesman. In Donetsk sector, Russia-backed militants violated the ceasefire nine times in Horlivka, Avdiivka, Shakhta Butovka position, and in Nevelske, mostly during the hours of darkness. The longest attack took place in Avdiivka, it continued for 2.5 hours. Ukrainian troops returned fire. In Luhansk sector, the militants violated the ceasefire five times. All the attacks were recorded north of Bakhmut road near Triokhizbenka after 17:00. No heavy weapons were used. 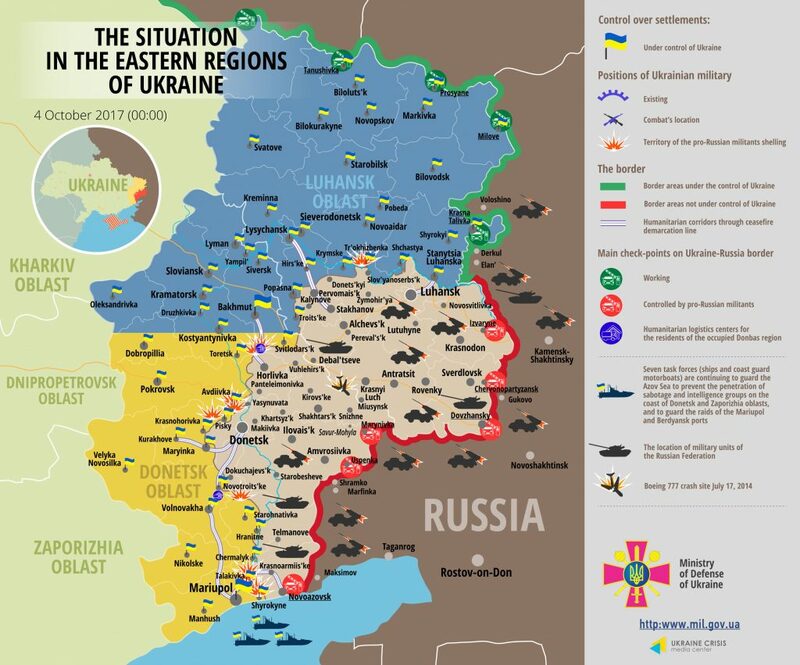 The ceasefire held in other frontline areas of the sector. No Ukrainian serviceman was killed in action yesterday, but one soldier was wounded in a hostile attack in Triokhizbenka. According to Col. Lysenko, the General Staff of the Armed Forces of Ukraine reported two UAVs flying over two Ukrainian military objects in the rear. “It was the fleet of separate military airforce brigade in Kherson region and technical area of joint fuel supply center in Chermalyk region. A light marker was found in the above-mentioned technical area. It can be used for an air strike,” he elaborated. “We call upon citizens to be vigilant and warn them about severe prosecution for unauthorized entry or photo- and video shooting of strategic military objects,” added the spokesman. Report on the military developments as of October 3 is available here. Interactive data on the shelling: chronology shelling chart and the interactive map.